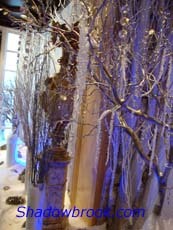 Your vision of your wedding day is to create a fabulous winter wonderland and I am here to help you achieve your goal. Getting married in the winter can be magical and exciting. Picture you and your hubby arriving at your ceremony or reception hall in a horse drawn carriage. You can have bells placed on the wheels of the carriage announcing your arrival. Winter celebrations are not as popular as the other seasons so you’ll be able to have more choices of catering halls at lower prices. Most businesses will offer a reduced rate rather than having their hall remain empty. Every guest that walked into the Shadowbrook Catering Hall in Shrewsbury, NJ was treated to this fabulously decorated, winter wonderland. It was an awe inspiring segue to a beautiful reception and the bridal couple didn't have to do a bit of decorating. 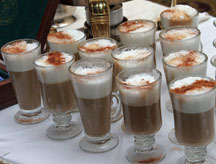 Warming your guests up upon arrival can be accomplished by having your family and friends served hot chocolate or cinnamon apple tea upon entering your reception. Of course Valentine's Day is a romantic time for your wedding. Choose red and pink as your accent colors for your centerpieces, cake, bridal attire and invitations. If you are getting married around the Christmas Season you can take advantage of the decorations that are already in place, leaving you more money to spend on your centerpieces and other items. 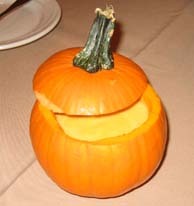 The scene below was from the lobby of a catering hall in NJ. 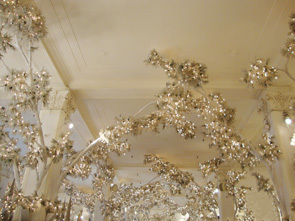 While I was Christmas shopping in NYC I was awed when I came across this ordinarily plain ceiling decorated so lavishly for Christmas. 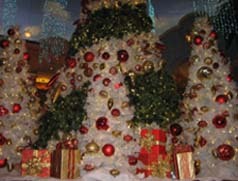 These decorations may be a bit costly but they can be created by getting twigs or branches, painting them white, intertwining white lights (or whatever color you choose) and gold or silver Christmas balls. You will need strong wire to secure the branches to the polls and hooks for the ceiling. The room was gorgeous and I immediately thought to tell you about how to transition your celebration room from drab to fabulous. 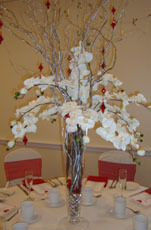 Evergreen branches placed in and around red poinsettia plants makes a striking centerpiece for your tables. When choosing your own and your bridesmaid’s dresses, remember it will probably be cold on your wedding day and you will want to have long sleeves, a shawl or some arm covering. For a dramatic look, consider renting a white mink wrap. Your menu choices for a winter affair will be different than those of a summer reception, so it’s a good idea to discuss your food selections with your caterer. You might consider including some body warming winter specials such as, pumpkin soup, mashed potatoes with gravy, a pasta dish, and a beef or pork entrée. Decorated Christmas cookies are always a favorite with the young and old. If you have a friend or family member who has the time and enjoys baking, ask them to make-up some Christmas cookie trays for your reception. I do hope my winter wedding ideas sparked your imagination and have put you on the right track for planning your perfect wedding. Tap here to find some fabulous bridal ideas.